We're in the middle of renovating an old timbered cabin on our yard. One of the nice things to do was saving the old things found in the attic. 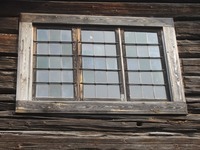 The strangest and perhaps oldest object was this window. It puzzles me because it seems much older than the other things found; those are from the late 1800. The window seems older though and my guess is that someone got hold of an old window perhaps used it for a while and then put it in the cabbin attic. Judging by marks in the wood it seems to have been one window in a larger window, like one quarter of four, thats what I think anyway. It was originally plugged and in the lower corners someone repaired it with iron nails. There where also a big iron nail in the center hole at the bottom. It has stormjärn and they look original, judging by the way they connect to the led. If anyone has an opinion of its age, it would be very interesting to hear. Glass and lead caming around the panes looks very 17th-century! But could be later. What size are the panes of glass? Yes it does! The glass is rather thin and they are 12x24 cm. Hmm, 12x24 is a little big for the 17th century, but could easily be early 18th century. Thanks for the suggestions Fred! Makes me wonder how it ended up here. Really cool window! I wonder what the notch in the upper left corner of the frame is for? Oh, I misunderstood you. I'm not sure. A started repair maybe. Could have been and actually that is what I was just thinking. Or it was a notch cut out in the way of something, such as the corner of a beam or other structural element that intruded into the window opening. 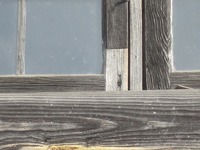 I just did repairs on four windows in our house where the outer storm windows and frames had started to rot, and I added pieces kind of like that, if that is in fact some sort of repair. 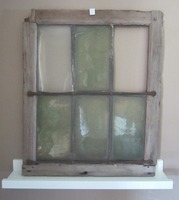 But of course these are very late 1900's vintage windows, not 17th or 18th century. The bars must have been some sort of security measure. If only objects could talk! Thanks for sharing. The broken glass was repaired really poor man style with a newer glass corner behind the old glass. Since it's the broken edge a repair attempt could be it. To take it apart would be tricky as it's so fragile. The stormjärn irons is indeed to make the really soft led construction stronger. I love old things like this. Also found other things like a lady hat from around 1900. Very high quality. Many tools, a homemade bucket and many hinges and build details for wood building. Also books, wich is cool as I really like old books, as they really do talk. Ah it is a structural strength thing. That makes sense. I have never seen this word stormjärn before. I really like old things too. To me they almost always inspire curiosity and questions, such as your very old window, and old books are usually very interesting. Yeah nothing beats the feeling of handling old thing and know how many years it's been around. The oldest book I have is from the 17th century and I really like the old handwritten comments. Tiny letters yet perfect handwriting! And the feeling of old lumppapper (textile paper) used back then is very nice and beautyful to look at. Another nice thing with books is that you often can find much information about it and they have a pretty humane pricerange. I'd love a copy of Gustav Adolfs Bible but it is way to expencive for me. Stormjärn was common, they used wood first but iron became common later on. Thanks for the picture and education on old windows in Europe! I wonder how much Gustav's bible would cost if it were for sale? A lot of the old books that are easy to get are bibles or christian books, wich is pretty logical considering how important faith was. Here is one Gustav Adolf bible for 24000 kr, about 3600 USD. Its basically a reprint of his grandfather Gustav Vasas bible taht is interesting as he decided to print the bible in swedish, not latin. A really big thing back then. That is also on my list of books I'd like, but it's even more expensive. I wonder what the notch in the upper left corner of the frame is for?